This easy braise of sausage, herbs, wine and vegetables is a little sassy, a little sloppy, and ideal for casual gatherings. Serve it with great hunks country-style bread for sopping up the juices. 1. Heat oil in a large, wide, heavy and preferably glazed pot over medium flame. When oil is hot, add the sausages and brown them lightly on both sides. Remove meat to a plate. 2. Add bay leaves, basil, oregano, fennel and paprika the oil; stir and cook a moment. Stir in onions, potatoes and fennel slices. Cook, stirring often, until onions are softened, 6–10 minutes. 3. 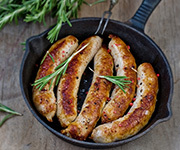 Cut sausages into thick rounds and add them to the pot. Add red peppers, cherry tomatoes, garlic and wine. Bring to simmer, cover, reduce to low and cook, stirring occasionally, until potatoes are tender, another 20–30 minutes. Add salt and pepper to taste. You can serve this immediately or let it stand off the heat for an hour or so to develop flavor, then reheat it. Portion the mixture into bowls or soup plates and sprinkle each serving with Parmesan cheese.